After trying for and missing the Geese flock at Van Cortlandt Park in the Bronx on Saturday November 29th, I returned on Sunday the 30th and was able to spend a few hours studying the some 1800 + Canada Geese on the Parade Grounds. I was pleased to find not just one Cackling Goose but several (totaling 6), after carefully eliminating those smaller Lesser Canada types from the flock. 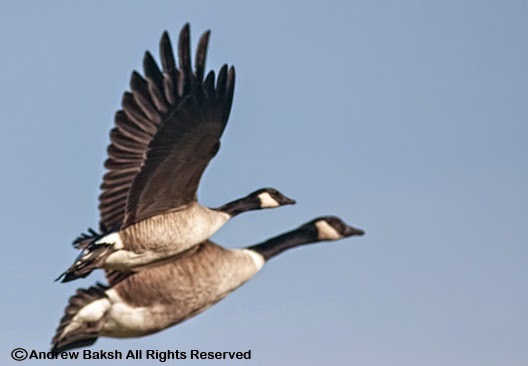 In my own empirical observations, I have learned that one of the fallacies of picking out a Cackling Goose from the flock of Canada Geese is relying alone on size, which results in many misidentifcations. It gets tougher with the lone bird; fortunately, Geese being the social creatures that they are, if we come upon a mixed flock like the one in Van Cortlandt Park, it gives us a chance to study them at length and learn more about the nuances of the various inter-grades and subspecies. All of the 6 Cackling Geese I found that day were of the common subspecies of Cackling Goose we expect here in the NYC/LI area, which would be the B. h. hutchinsii – Richardson’s. 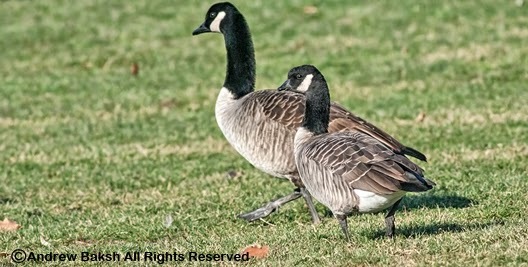 Both are Cackling Geese; note the color variation on the back as well as the head. 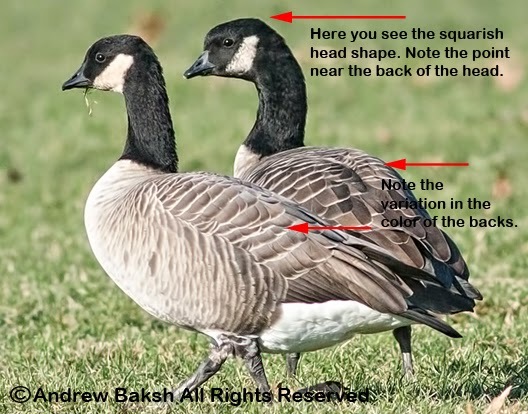 If you have trouble picking out Cackling from the larger white-cheeked Geese some of the following identification indicators might help. Start with the Bill and Head - If you take a look at the following image, you would notice that (A) The overall shape of the head is blocky/squarish, the base of the culmen shows a steep incline to the forehead. (B) The bill is comparatively smaller than the larger white-cheeked geese. If the Bill and Head pass the first two indicators above, pay attention to the size and general appearance. Ask yourself these questions. (A) Does the Cackling candidate have a shorter neck than the nearby white-cheeked geese? (B) Does the legs look shorter than the nearby white-cheeked geese? If the first two sets of identification indicators pass successfully, then you may want to look at the plumage. (A) The black stocking on the neck often ends in a border near the breast giving a "white collar" look. This is sometimes more prominent than others and is variable within the larger white-cheeked geese so exercise caution when relying on this field mark. (B) Some folks rely on the silvery look on the back but that is also variable with some Cackling showing a darker back. Cackling above with "white-cheeked Goose (presumably Canada) below. If you want a more in depth approach at distinguishing Cackling from the larger white-cheeked Geese, then you might want to check out David Sibley's article here.